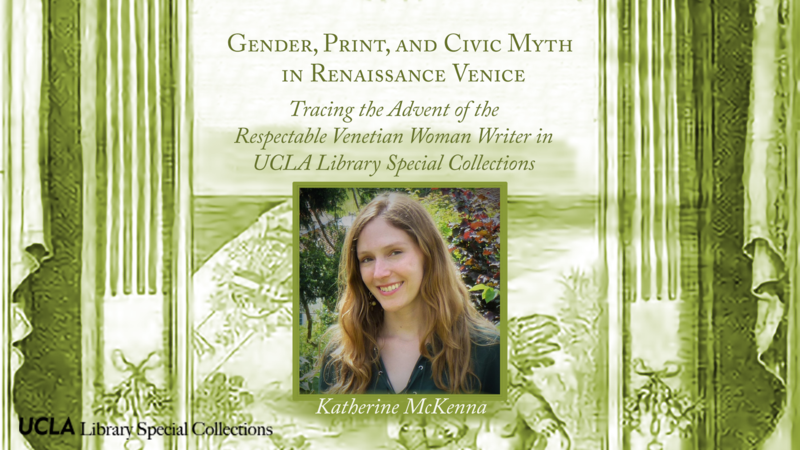 Please join us for Gender, Print, and Civic Myth in Renaissance Venice : Tracing the Advent of the Respectable Venetian Woman Writer in Library Special Collections, a lecture by Katherine McKenna. Katherine is a 2018 Ahmanson Research Fellow and a Ph.D. Candidate in History at Vanderbilt University, where she studies early modern Italy and the history of women and gender. Her dissertation, titled “Breaking Silence: Women’s Radicalization of the Querelle des Femmes in Venice, 1550-1650,” explores the rise of the respectable Venetian woman writer and the advent of feminist social criticism within the Venetian querelle in connection to civic myth, state politics, and the relocation of female writing from bordello to casa. As a researcher-in-residence at UCLA, Katherine is working with the Ahmanson-Murphy Collection in Early Italian Printing. She is specifically looking at sixteenth-century texts produced by the Guerra, Rampazetto, Farri, and Pinargenti presses (to name a few), all of which produced civic print or fostered women’s literature. In this period, the Venetian Republic’s empire and politico-economic power were failing as a result of the Italian Wars, Mediterranean strife with the Ottomans, and the loss of its spice trade monopoly. In response, Venice increasingly turned to civic myth to prop up its claims to excellence. Katherine is using UCLA’s archive to investigate how this shift and the Venetian preoccupation with identity-fashioning more broadly moved local women into print at the end of the century. To that end she is looking at civic orations, songs, and island books whose contents remade the state as a city of God, bastion of liberty, and arbiter of cultural spectacle. Special attention is given to cinquecento works produced after the Battle of Lepanto and War of Cyprus (1571-1573), the aftermath of which ushered in the first single-author political offerings to Venice by woman authors.